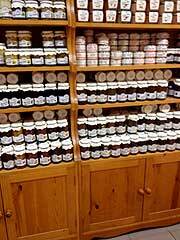 Essentially the principal ingredients used in jam making are simply fruit and sugar. However, depending upon the actual recipe itself, there may be a number of additional ingredients added to the pot, such as spices, ginger and lemon juice (for fruit with little in the way of natural acid). 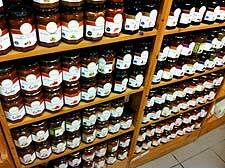 Keen gardeners with surplus crops will find that jam making is a useful way to prevent spoilage and waste, as well as creating a tasty treat for toast in the morning, or an afternoon tea in the garden with cakes and scones. It is always important that any fruit being used as an ingredient should be clean, fresh, in good condition (not rotten, mouldy or overripe) and completely dry. If the fruit is damp or wet, then the water may actually dilute the natural pectin and prevent the preserve from achieving a good set. Boiling the fruit will always help to purify and sterilise it, killing off any natural yeast and preventing the fermentation process. It is worth making a mental note that in general, fruit that is very slightly underripe actually contains noticeably higher levels of pectin than fruit that is overripe. In most cases, unless specified by the particular recipe, a typical white granulated sugar is ideal for jam making, as the resultant jam will be pure and clear. A granulated sugar tends to dissolve slowly and evenly, although caster sugar can also be used if required. It is possible to use brown sugar, golden syrup, treacle and honey to sweeten the jam mixture, although you should be mindful that the overall flavour may change, particularly since brown sugar does contain molasses to some extent. Also, if you depart from following the exact ingredients detailed in the recipe, as well as altering the quantities, the jam may not set as well. A special slow-dissolving preserving sugar is available for purchase. 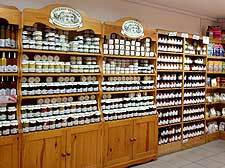 However, most experienced jam makers generally agree that it is not necessary, since granulated white sugar works just as well for most recipes and is less expensive. When using fruit with low pectin levels, or if you are making more of a jelly than a jam, it may be necessary to add a sachet or two of powdered commercial pectin or another setting agent, such as gelatin. As the quantities required will vary from make to make, you should always follow the instructions on the packet.